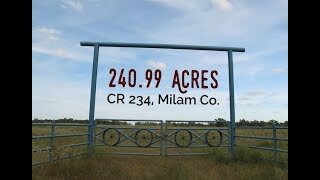 240.99 Milam Co. Cattle & Hunting Ranch with minerals! CONTACT PENDING! Phenomenal 240.99 acre property, that is set up perfectly for a cattle and hunting property, and future residential uses. This property is approximately 60% open and 40% wooded, with large post oaks, cedars, elm, water oaks & pecan trees. Sandy creek runs along the eastern side of the property and provides shelter for numerous deer, hogs, and turkeys. Mostly native pasture in place, along with rolling terrain. Numerous trails run through the property and are great to get to your hunting stands, or use for horse riding or ATV&apos;s. Four ponds create a great place for fishing along with water for cattle and wildlife alike. This property is ag exempt, and currently has cattle on it. New fences surround majority of the perimeter. Access from CR 234, which is less than 2 miles form US HWY 79. Less than one hour from both Austin and B/CS , and less about 2.5 hours from Houston and Dallas! Property has full utilities in place, with water, septic, and power installed. A metal shop is located in the northwest corner, and would serve great for storage, or for shop use. Some minerals are available with the property! NOTE: Buyer&apos;s broker must be identified upon first contact and accompany buyer to inits and subsequent showings to be allowed full fee participation. If this condition is not met, fee split will be determined by listing Broker.